Anaheim, CA – More than 10,000 third-graders from more than 100 schools from all corners of Orange County will descend upon Angel Stadium the morning of Thursday, Nov. 13 for the annual “Gift of History” celebration. 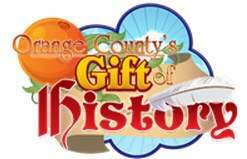 The educational program will teach students about Orange County’s rich history in an interactive and entertaining manner, and include presentations from elected officials, business and regional education leaders. ABOUT: The Gift of History is a partnership between the Orange County Education Foundation, The Literacy Project and several key sponsors including: Kaiser Permanente, Schools First Federal Credit Union, Disneyland Resort, HP, Orange County Department of Education, Angels Baseball, Orange County Water District, Orange County Transportation Authority, Southern California Edison and Anaheim Public Utilities.